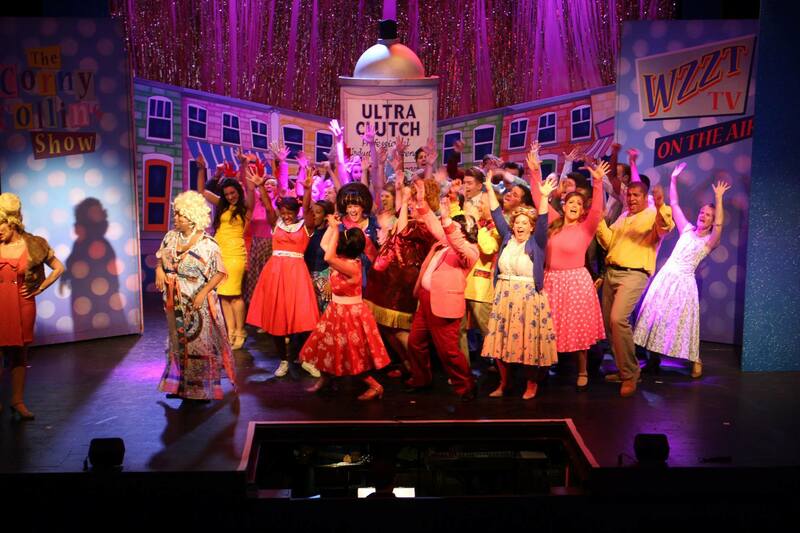 I directed Hairspray for Bromley Players in October 2014. Costume – 1960’s – lots needed including wigs! Set – Variety of settings – normally hired in. Technical – Fairly demanding – moving lights and many radio mics desirable. This upbeat and fun show is set in the early 1960’s and follows plus size Tracy Turnblad as she manages to get herself a spot on the Corney Collins show. She uses her newfound influence to try to tackle the racial inequality that existed in America in this time, whilst falling for and getting the boy of her dream Link Larkin. You need an all singing, all dancing, youthful and mixed ethnicity cast for Hairspray. The show centres around Tracy so you need someone that can carry the show and cope with the pressure of being off stage for longer than a few seconds only once in the show! Amateur dramatics is also known for being a fairly ‘white middle class’ hobby however for this show the society has to be able to attract black cast members due to the plot focusing on race. A society would need a black guy that can dance and sing to play Seaweed, a young black girl to play Little Inez (Seaweed’s Little Sister), an older black, plus size woman with not only a strong voice but oodles of stage presence to play Motormouth (Seaweeds mum), 3 strong black female singers able to sing in close vocal harmony to play the Dynamites as well as a few more in the ensemble to be in detention with Seaweed and hanging out at the record shop. Whilst in theory when you are given the rights you get told that you can cast the show in a colour blind manner however to me this just doesn’t work. There are so many references within the script and lyrics to race that having a white Seaweed, Motormouth or Little Inez just means a lot of these jokes fall flat and the show looses some of its heart. You also need at least 5 girls and 5 boys (playing age of around 18) to play the council members, including Amber and Link – they have to again not only look the part – i.e. white and in contrast to Tracy’s plus size but also be able to dance to a high standard. Whilst getting the girls may not be difficult finding enough young guys to fill this is a consideration. A lot of people think that Hairspray is just for young performers however there is some great roles for older performers, this includes the drag role of Edna, Tracy’s dad Wilber, Amber’s mum Velma, Penny’s mum Prudy (who has some brilliant one liners), Spritzer as well as some great cameos such as the lesbian gym teacher, the prison matron and Mr Pinky. 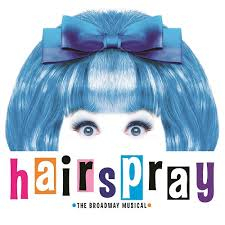 Hairspray is not really a production that you can do well simply using rostra and levels. In the plot is things such as Edna appearing out of a giant Hairspray can to Penny being tied to her bed and Seaweed appearing through the window to save her. There are numerous locations – from the TV studio to a classroom, from the Turnblad’s front room to a jail and from the school gym to Motormouth’s record shop. Whatever set you use it needs to be clever therefore and capable of swift scene changes or this would become a very long production!! In the production of Hairspray that I directed we used the smaller set (they have 2) from Scenic Projects and along it was not cheap it really helped give the show the colour and the wow factor. Due to the size of Hairspray and the amount of characters (and therefore cast) this show is a challenge to costume and one where you will need a large commitment from your wardrobe department. You will face challenges such as Tracy’s wig – the look is iconic so it must be perfect. The wig to buy new is around £150 and there are very few places that hire the wig out so sourcing one can be a challenge. You will also need to find dresses (and shoes) for Edna – the drag role which must range from a housecoat and slippers to a matching dress for her and Tracy in Welcome to the 60’s to another glam number for the finalie (all whilst wearing a fat suit with built in bra!! ), numerous dresses for the council girls and female ensemble and even more wigs for the council and Amber for It’s Hairspray and the finalie. If, like us, you end up with a Link who doesn’t have a good head of hair then a wig for him also becomes necessary. You will also need someone with imagination to costume Motormouth, Seaweed and his friends a different vibe to the council. We did this by using bright reds, oranges, greens for Seaweed and co and pastel shades for the council. In the version I directed, with a cast of around 40 we ended up with around 150 costumes. As mentioned briefly above you will need a lot of radio mics for this show – We used 18 but we could have easily used more as at times not all soloists or council members had a microphone. This therefore put the cost of the show up. Due to the fun, upbeat, high energy nature of the show moving lights also adds an extra dimension so if you have the option to use these it is something I would recommend. One consideration that I hadn’t factored in prior to the start of the rehearsal period was the fact that nearly every number has a lot of people on stage at once – this means that at nearly all rehearsals you need a decent size rehearsal venue. Where we often had rehearsals for principle scenes for other shows in a smaller room and therefore cheaper but for this show that simply wasn’t possible and therefore can put rehearsal costs up. Due to the sheer amount of large numbers in this show the amount of rehearsal hours in this show is also more than your average musical. I’m a bit biased on this one as I directed the show but one thing that I think helped is the relationship between director and the rest of the production team – as there is so many musical numbers – most of which danced they must all share the same vision and the director may need to look at numbers (such as Timeless) that sometimes you may leave to the choreographer in order to give the choreographer an opportunity to focus on the bigger dance numbers. It therefore helps if the director has a dance/movement background. The choreographer also needs to be able to choreograph a range of styles – from the prim and proper council numbers to the cool numbers that Seaweeds gang and establish a very different style between them. The whole production team also need to be able to work with large numbers of people – so for the choreographer and director they need to be comfortable staging the sheer volume of people that are on stage number after number and the MD needs to be happy working one on one with the soloists, teaching tight harmonies to the Dynamites to teaching 40 + people the harmonies for ensemble numbers. This is one show that you do not need to worry about selling! The show I directed sold out well in advance of show week but even if performing at a massive theatre you have the bonus of a large cast to help sell the show. There are also plenty of well known numbers which can be performed at promotional events. Hairspray is a fun show that is challenging but well worth all of the extra hard work this show requires. It is not for the faint hearted and you must be sure that you will attract people to cover all parts (in all aspects – look, dancing, singing, acting)- ranging from Amber to Tracy and from Edna to Seaweed. A strong production team and technical team is important and ones that work well together as they will be spending a lot of time on this show! I am looking for information on the cost of putting on hairspray. We are a small amateur theatre company that performs in a theatre with a capacity of 350. We expect Hairspray to be an expensive show to put on, we are at the moment doing our research. Is it possible to get a bit of a breakdown for set and costumes. We have excellent support on the back stage and technical side of things so costs aren’t a concern in these areas. Case size we expect will be about 30. It really depends on the set you want. We hired it for around £1500 + travel. Costume wise we have a full set of costumes which we hire out at a few hundred depending on how many you want. Less if you only need a few of them. It wasn’t a cheap show to do but it sold brilliantly which helps!